The Twin Cities Metrpolitan Council's 2030 Transitway Plan featuring commuter rail, light rail, bus rapid transit and improved bus corridors. Over the past several weeks, we’ve been running our ongoing series where we ask the question: How could America Fast Forward work for other cities around the country? Well, Minneapolis was definitely on our radar, but it looks like Minneapolis Post writer Steve Berg beat us to the punch. In his story, Los Angeles tries to accelerate transit: Would it work here?, Berg takes a preliminary look at how federal loans and financing could support Minneapolis’ hope to greatly expand its rapid transit network. 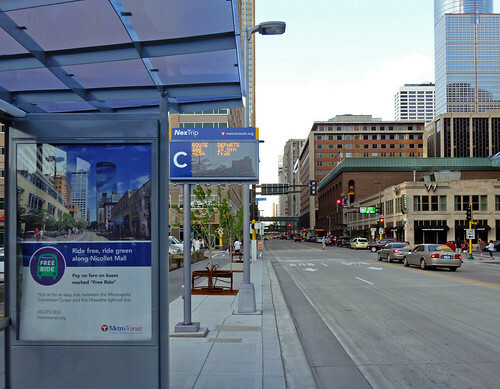 A bus rapid transit station in downtown Minneapolis via Flickr user Payton Chung. But before we delve into that question, some background: The Twin Cities region reached a population of 2.85 million in 2010, with most of the recent population growth happening in the suburbs, according to the most recent Census Bureau data [PDF]. The challenge for transportation planners in the region is to knit together these existing communities, while planning for future development in an era of increasing gas prices and decreasing vehicle miles traveled. The current transit system [PDF] provides a total of 218 transit routes, including a variety of fixed-route bus lines, one light rail line, one commuter rail line and an assortment of vanpool and paratransit services. To support a goal of doubling transit ridership by 2030, five counties in the Minneapolis-St. Paul metro area approved a 1/4-cent sales tax increase to pay for a large expansion of “transitways” — bus rapid transit, light rail and other transit that runs in its own dedicated right-of-way. The plan calls for building a half-dozen new transitways on top of the existing network.So far they’ve had limited success. The 12-mile Hiawatha light rail line — the state’s first — opened in 2004 and draws more than 30,000 boardings per day. Since then, a number of popular BRT lines and the Northstar commuter rail have expanded the rapid transit network. 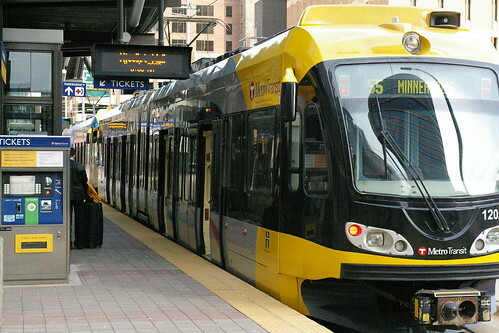 The question, thus, is how can the Minneapolis-St. Paul region get those planned transit projects on line sooner, to meet increasing demand for transit and to better connect the region? Minneapolis' Hiawatha light rail, via Flickr user joelplutchak. Bingo. So, would it work for the Minneapolis-St. Paul region? It’s good news for Metro to see AFF getting ink and consideration in other metro areas — other regions we’ve contacted have known or said little about the program, even when AFF is poised to possibly help them. We’ll keep you posted on any developments. In the meantime, keep an eye out for more stories in our series, which so far has featured Denver, Salt Lake City and Charlotte.